All transactions are safe and secure with a reliable history in online purchasing behind each of our associates. 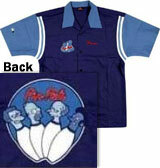 Buy the Pin Pals Bowling shirt or Patches to own Simpsons clothing and merchandise. This Pin Pals Simpsons bowling shirt is a tribute to Homer's bowling team, the Pin Pals. Homer formed the team after he and Moe were told that it was "league night", and that they could not bowl unless they had a team. This coveted piece of Simpsons merchandise has quickly become a collector's item. The front features a smaller Pin Pals logo along with the name Homer stitched in red near the breast. In addition to the Pin Pals Bowling tee or Patches above, browse the Simpsons Clothing Gallery for more apparel like men's and women's clothes, kids shirts or hoodies.